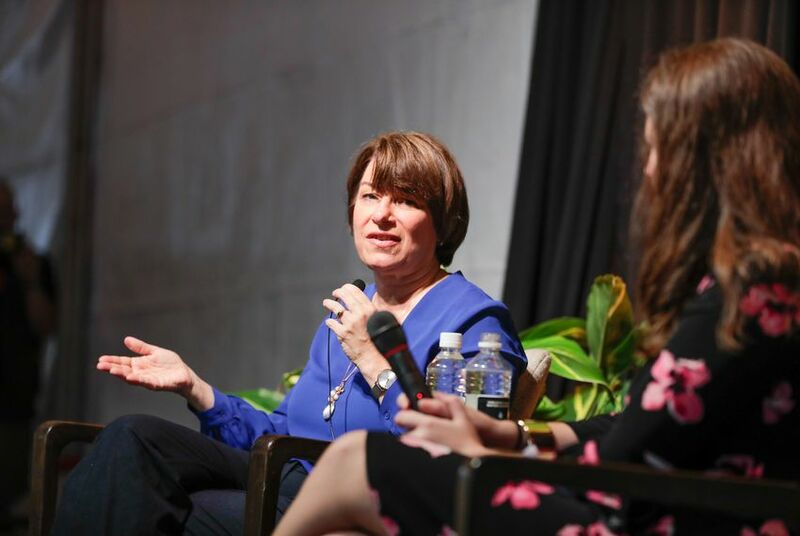 Sen. Amy Klobuchar says Brett Kavanaugh is "not the person for the Supreme Court"
At an interview Saturday at the Texas Tribune Festival, the Minnesota Democrat talked about the Supreme Court and the Mueller probe — and carefully skirted questions about her own presidential ambitions. Kavanaugh, along with Christine Blasey Ford, a California psychology professor who has accused him of assaulting her while both were in high school, appeared before the Senate Judiciary Committee Thursday in a marathon hearing that alternated between tears and shouts. Klobuchar had perhaps the most combative exchange with Kavanaugh, who ultimately apologized to her for his conduct. The senior Minnesota senator — who has been candid about her father’s struggle with alcoholism — asked Kavanaugh whether he had ever drunk so much that he lost some of his memories; some who knew the judge in his youth have alleged that he often drank to excess. Despite Kavanaugh’s apology, Klobuchar said she was concerned about what she called a tainted confirmation process — Democrats have complained that Kavanaugh’s nomination was being forced through without proper investigation. An agreement was brokered Friday, and U.S. Sen. John Cornyn, R-Texas, announced Friday that the full confirmation vote would be delayed a week while the FBI investigates allegations of sexual assault. Klobuchar said she and her Democratic colleagues had been working for days to persuade U.S. Sen. Jeff Flake, an Arizona Republican considered to be the key swing vote, and others on the committee that an FBI investigation was necessary. “What happened yesterday is Sen. Flake just basically couldn’t stand it anymore” that the contentious process could "tear the country apart," she said. Klobuchar argued that an FBI investigation is the proper method for vetting any evidence, including a set of calendars from Kavanaugh’s high school days that he says show he could not have committed the assault. The confirmation process is just one of many democratic institutions that’s been tested by President Donald Trump, she said, citing also the need to protect an independent investigation into the presidential campaign’s potential ties to Russia by preserving the role of Deputy Attorney General Rod Rosenstein. “We believe strongly that you want to keep him there,” Klobuchar said of Rosenstein, whose job is reportedly in jeopardy. The only reason to oust a respected career official “would be related to his supervision of this investigation,” she said. Klobuchar, who has been floated as a potential Democratic candidate for president in 2020, did not rule out a run, but said she — and the rest of the country — should be focused on 2018. Still, she also seemed to hint at a strategy for that potential run, pointing to Hillary Clinton’s 2016 losses in midwestern states and emphasizing her own ties to farming communities that largely favored President Donald Trump. And she grounded it in an old family anecdote: Her husband — a middle child in a large family — was sometimes briefly forgotten on family road trips, she said.